The exhibit opens today in Portland, Oregon, where our Sukkah, along with several other winning designs, are on display. The exhibit is also part of Design Week Portland, a weeklong series of events revolving around creative thinking. For those of you interested in how we constructed our sukkah, following is a brief explanation of the materials and processes we went through to turn our design into reality. 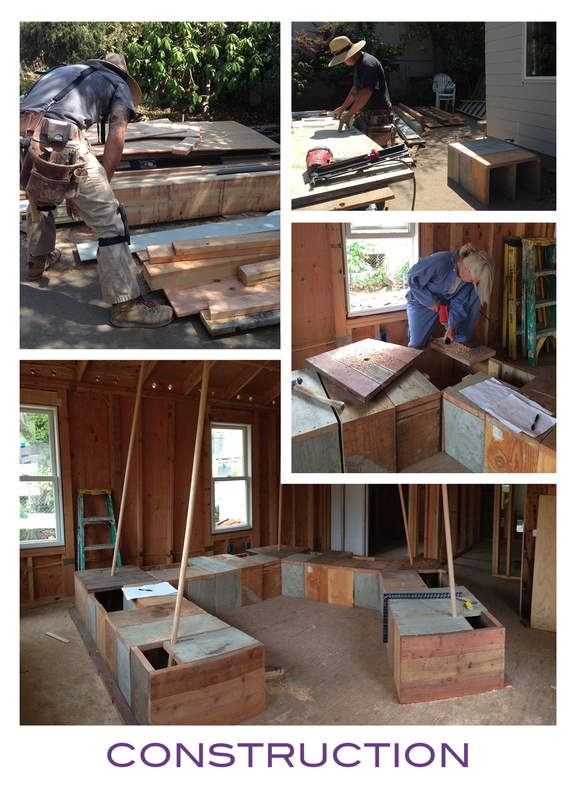 Waste is a part of any kind of construction, and at one jobsite this summer, it came in handy. We used old concrete formwork (wood framing that concrete is poured into which gets removed afterwards and is covered in bits of concrete), scrap too short to use anywhere else, and wood from demolition. This resulted in our benches having varied widths, textures, and colors–exactly the effect we were going for. Our design also incorporated live wheat. Although we sprouted organic wheat seeds immediately after being selected for the exhibit, we knew the wheat wouldn’t grow fast enough for our purposes. So we redesigned to incorporate dried wheat, to show visitors what the wheat growth cycle looks like. According to the rules of sukkah design, the roof, or sechach, must be made out of plant material. We decided to use cotton for both so we could use natural plant dyes to get the blue color in our design. The blue represented day turning to night, and allowed white constellations to stand out in the sechach. After a few dye tests, we settled on black bean dye (the dye liquid is made from soaking dried black beans for days; plus you can eat the beans afterwards), which is supposed to result in a deep blue color. For some reason, our tests turned out dark purple/blue, and our final dyeing ended up a gradient of pink to purple. We liked the effect – sunset is, after all, how day turns to night. All in all, this was a great learning and team building experience for us. It allowed us to be creative in a different way and to employ techniques not ordinarily used in designing and building housing. Almost everyone in the office and the field got involved, from dyeing, to crocheting, to growing wheat, to cutting wood, and to cooking (and eating) the 50 lbs of beans we had leftover from dyeing. For an update on our other recent creative endeavors, check back next week! 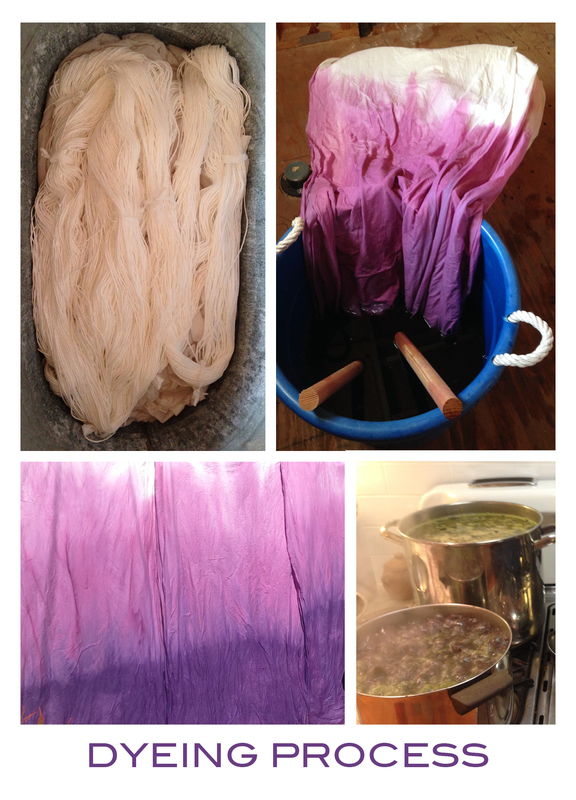 Special thanks to Inbal Shalev for her natural dye advice. For information on black bean dyeing, check out knitbyahenshop’s tutorial. If you want to see constellations above any location in the world, we sourced ours from this stellar site. See these news articles in The Oregonian and The Jewish Daily Forward about Sukkah PDX and our sukkah. Thanks Anita! We had such a fun time making it and we’re glad other people get to enjoy it.